Newly discovered: The olinguito (Bassaricyon neblina) is the first carnivore species to be discovered in the American continents in 35 years.Courtesy Mark GurneyThe headlines call it the discovery of a new species, but actually, it's been around for quite a while. We just didn't know what it was by thinking it was something else. But today the Smithsonian Institute announced it's identified a new mammal species, the first new mammal to be identified in the Americas in the last 35 years. 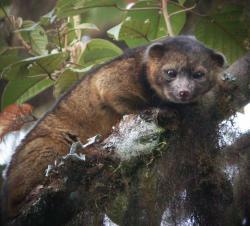 In making the announcement of the newly classified olinguito (oh-lin-GHEE-toe), the Smithsoian described its appearance as a cross between a house cat and a teddy bear. Native to Ecuador and Columbia, the olinguito is in the same family of mammals as racoons, is a nocturnal carnivore that has been living under a mistaken identity for over 100 years. The discovery kind of came by mistake as researchers were studying olingos, another South American mammal. Studies of museum-preserved specimens uncovered differences in skull shape and teeth. A research team then went off to northern Andes mountain regions to confirm these differences with live specimens. The found that olinquitos were a smaller, denser-furred look-alike to olingos and recorded their behaviors on video. It's not like the olinquitos have been hiding or anything. Back in 1920 a New York zoologist thought a specimen he had collected might be a species different from olingos, but never followed up on the work to make the discovery. Olinguitos have been displayed in zoos as olingos at various times in the 1960s and 1970s. Science Buzz is supported by the National Science Foundation. Copyright © Science Museum of Minnesota, 2004-2019, except where noted.